An educational, eye-opening experience, suitable for all ages. Native American weapons, pottery, and jewelry dating back hundreds of years. The 1912 Little Falls Textile Strike began on October 9, 1912 and was not settled until January 3, 1913. Memorabilia, collections, and Honor Certificates to remember the service members who fought during World War II and the Korean Conflict. Trophies, photos, and memorabilia from Little Falls Athletics teams. Memorabilia and collections reflecting Little Falls musicians and the music of the 1950s, 1960s and 1970s. 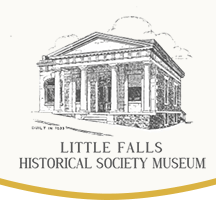 Over the past two centuries the waterways of Little Falls have undergone major alterations.